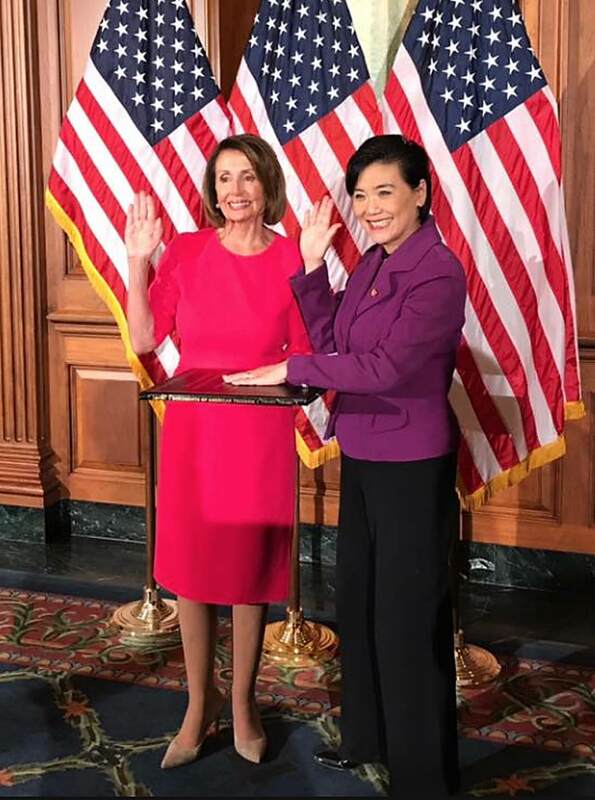 Rep. Judy Chu is sworn in by House Speaker Nancy Pelosi (D-San Francisco). 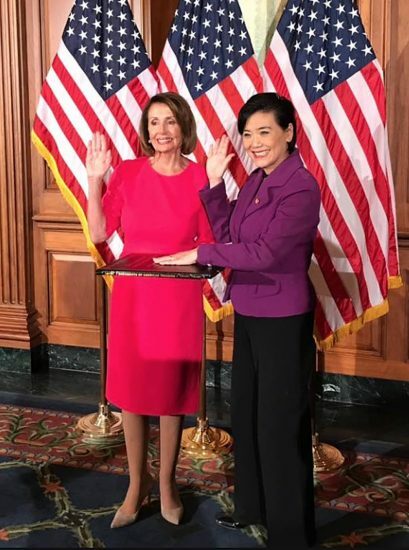 “This new era starts with a Congress that is more diverse than ever, one that better reflects the country we represent. And starting on Day One, we are working to return power to the voters and integrity to our government. “That starts with passing H.R. 1, which is going to make it easier for Americans to vote and have their votes count. It also helps restore faith that government is working for the people by requiring transparency through restrictions on lobbying, changes to take corporate money out of elections, and disclosure of presidential tax returns. “Ending corruption also requires a Congress willing to conduct its oversight role – which is exactly what we are prepared to do, serving as a check on the executive just as the founders intended. “In the weeks and months ahead of us, we are going to advance legislation to restore morality and sanity to our immigration laws, lower the cost of prescription drugs, put more Americans back to work, defend women’s rights, and pass fair tax reform that helps middle class families get ahead. “But before we can get back to work for the American people, we have to get the government back to work by ending Trump’s government shutdown. Democrats are ready right now to pass a funding bill that was unanimously approved by the Senate last month, but unfortunately, the shutdown will not end until Donald Trump is willing to let it end. Fund the wall, move on.